Theresa May’s handling of Brexit has proved “beyond doubt” that independence is the only way to safeguard Scotland’s future, Michael Russell has claimed. The constitutional relations secretary said it was “time beyond time” to break away from Westminster, as he stated the Scottish Government had a “cast-iron mandate” to hold a second referendum. 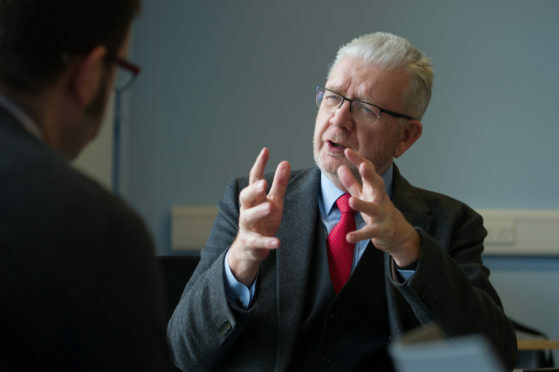 Mr Russell, speaking at an Institute for Government think tank event in London, insisted Brexit had highlighted “the very fragile position of Scottish autonomy and decision-making”, with Scots having overwhelmingly voted to stay in the European Union in 2016. He said: “That is such an enormous change that it would by itself justify returning to the people of Scotland to reconsider the issue of independence. “Brexit has not only created the context for a reconsideration of independence but by the means of its delivery has also created the necessity for such a change. “It is now beyond doubt that there can be no guarantee any time and on any issue, even on any devolved issue, that Scottish views and the actions of Scottish institutions are safe or respected within the current United Kingdom. At the event, Mr Russell also spoke of his fear of a no-deal, saying: “I remain very worried about a no-deal. “That’s why the Scottish government is working intensively to make sure that we are as prepared as we can be. “We will do everything we can. We can’t do everything but the likelihood of that does increase day-by-day there is no settlement. Asked by the Press and Journal whether he was personally stockpiling food to prepare for no-deal, he said: “No I’m not personally stockpiling food. I think that would be foolish. “My wife bought another packet of toilet rolls but I’m not even sure where they are.